Dog farm/slaugherhouse in Yongdang, Yangsan, South Korea. 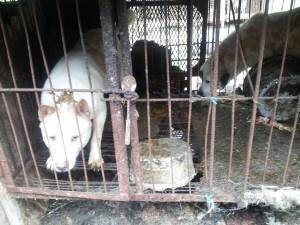 Photo: SaveKoreanDogs.org. 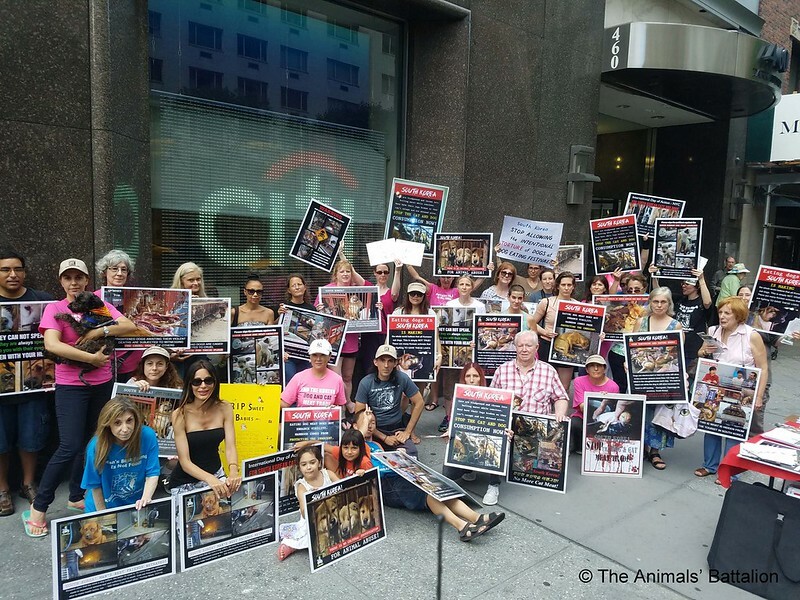 For the fourth year in a row, the Animals’ Battalion will be holding a series of demonstrations outside the South Korean Consulate in New York City. We are excited that this year, thanks to Stephanie and Peter Holman, the same demonstrations will be held at the South Korean Consulate in Seattle. Their purpose is to make the South Korean Government aware of how strongly we abhor their indifference to the mass cruelty and suffering inflicted on sentient animals in the dog and cat meat trades, and the failure of the government to bring about an end to this evil industry. Click HERE for New York Demonstration. Click HERE for Seattle Demonstration. In mutual support with the Animals’ Battalion, the Holmans and KoreanDogs.org, no matter where you are in the world, we really hope that you can show your support and make your feelings known, by joining us to be part of ‘one voice’: we are asking you to take part in a telephone and mail ‘blitz’ at the same time as these demonstrations are being held, to back them up by getting your own message across to the South Korean Embassy and Consulate Generals offices within your country; details of which you can find here: http://koreandogs.org/what-you-can-do/contacts-for-protest/call-south-korean-embassy/ You can also find any updated information HERE. Click HERE to join us on Facebook event. Day 1 – Tuesday, July 17, 2018: Click HERE to join in New York. Click HERE to join in Seattle. Day 2 – Friday, July 27, 2018: Click HERE to join in New York. Day 3 – Thursday August 16, 2018: Click HERE to join in New York. I am contacting you today, as I wish to register my strongest protest to the indifference you, your countrymen and your government show to the suffering and cruelty that is carried out, by many people, within the dog and cat meat trades. This cruelty and suffering must end, and I cannot see it ending until your country puts a complete stop to these aberrant trades – trades which have no place in any modern day society. South Korea is a country that boasts a wealth of high-profile companies, with a 14th GDP rating; and if it still wishes to be seen as a modern, forward-thinking, civilized society, then your government must rethink its policy on allowing these illegal and unjustifiable trades to continue. I sincerely implore your government to immediately begin policing and enforcing your animal protection laws; and, until it brings about the end to both the dog and cat meat trades, I will boycott all forms of tourism, all products, and all services from your country; and I will urge others to do the same. We recommend that the best way forward, when calling an Embassy/Consulate Generals, is to politely ask to speak to a representative who has the authority to talk about the dog and cat meat trades within South Korea. The representative may well deny all knowledge of any illegality/wrong doing within these trades, or say that they are unable to help on this issue. If they are not forthcoming, then you might make the following statement or similar wording of your own – and please ask them to keep a record of your call and what you have said. “As an animal lover, and part of a high-profile animal rights group, which has supporters across the globe, I wish to register my deep concern about the unregulated, cruel and abusive dog and cat meat trades in your country, South Korea. Photo: Thank you, The Animals’ Battalion for giving a voice to the animals of South Korean Dog and Cat Meat Trade!!! Day 3 Demonstration: August 16, 2016. Photo: The Animals’ Battalion. I & THE DECENT, CIVILIZED MORAL*WORLD NOW BEING EXPOSED WORLDWIDE, STAND UNDETERED STRONG AGAINST CHINA, STH KOREA WORST SLAUGHTERED MILLIONS PER YEAR OF DOG’SN CATS FOR MEAT N GREED!!!! NOTED OF THE WORST DEPRAVED, BARBARIC CRUEL SADISTIC BRUTALIZED TORTURE N BEATEN, BURNED,** SKINNED N **BOILED ALIVE SCREAMING DAILY DOGS N CATS NBLEGAL N SERVED IN RESTAURANTS ETC DAILY!!! BOYCOTT ALL CHIHA N STH KOREAN COMPANIES N PRODUCTS AS CIVILIZED MORAL WORLD IS **DISGUSTED!!! THANKS! MOST DISGUSTING DISTURBING MORAL VALUES OF HORRORS ANNUALLY N FESTIVALS OF HORRORS WHERE MILLIONS OF DOG’S CATS ARE UNHEALTHY STARVED DISEASED BEATEN BURNED STARVED,**SKINNED N BOILED**ALIVE, TO CAUSE UNBELIEVABLE SUFFERING N CRUEL N BARBARIC INHUMANE LIKE NAZI STYLE KILLING N EATEN!! THESE ARE HUMANS MOST CHERISHED CLOSEST DOMESTICATED BONDED ANIMALS SPECIE’S OF DOGS N CATS NEVER FOR FOOD, EVER!!! WE THE CIVILIZED MORAL WORLD WILL BOYCOTT YOU WORLDWIDE N NO TOURISM N KEEP EXPOSING YOU STH KOREA LEGALIZED DOG+ MEAT FARMS BY THOUSANDS!!! WE STAND AGAINST YOUR EVIL CRUELTY!!! BOYCOTT PRODUCTS!!! STOP THIS STAIN N SHAME ON YOUR NATION AS THE WORLD SEES N ABHORRS YOUR NATION BACKWARDS ACCEPTANCE OF THIS DESPICABLE PRACTISE!! DOGS TORTURED ALL THEIR LIVES FROM THE MOMENT THEY ARE BORN, THEN TAKEN TO A VERY CRUEL SLAUGHTERHOUSE OR PLACE AND TORTURED AGAIN AND AGAIN AND AGAIN IN THE MOST EVIL AND CRUEL WAYS IMAGINABLE OVER LONG PERIODS SO THAT ASIAN SCUM OF THE EARTH DOGMEAT EATERS CAN EAT THEM AND NOT CARE HOW THEY WERE TREATED AND KILLED. aALL THIS FOR SUB-HUMANS’ GREED. HOW CAN SUCH PEOPLE EXIST? VERY EASILY IT SEEMS! I agree with you on every single word. STOP à ce commerce cruel ! Just disgusting! Poor cats and dogs… How can people be so cruel… I hope they get diseases (as their slaughterhouses are so dirty) and die! All those cats and dogs eating shitheads!!! The world of compassion is begging you too end trading & eating Dogs & Cats these are Not to be treated in this way they are domesticated animals trusting of humans loyal & loving. You must understand how wrong this is, the world and many of your own countrymen are appalled with this atrocity. Wishing you a successful protest! If only these horrors would end! Cannot imagine why any culture would endorse such abject horrors, cruelty and brutality! THANK YOU to everyone who are participating and voicing an end to this savagery! I WRITE TO YOU TO CRY MY DISGUST, STOP IMMEDIATELY IN SO MUCH! the malice you show on dogs and cats has no justification, korea shame! This is Barbaric and disgusting how any animal can be treated in this way, these animals deserve better, who are humans to decide their fate.. This is just sick.. Please stop this senseless and Cruel trade….How would you like to be tortured the way you torture these poor animals..Animals that just want to be loved and have a chance to live their life! They have a right to a life. People who torture innocent and helpless animals have no place on this earth and there is a special place in hell waiting for you. For the life of me, I cannot comprehend how anyone can commit such cruelty to a living thing and have no conscience whatsoever. These helpless animals are God’s creations and were never meant to endure this barbaric cruelty. These are man’s companions, not meant for consumption. For pete’s sake, it’s 2018 and I do not believe there is a shortage of food to have to resort to people’s pets for the sake of food. Please stop and consider what this animal endures for the sake of a meal…you are a heartless country and will pay the price for this – if not in this life time, then in another. I called the Embassy in Washington, D.C. and I have been on hold for about 10 minutes with no end in sight. Much to their dismay, I will not hang up or give up. Thank you, Becky!! Don’t give up please. You are the voice for the Korean dogs and cats. I know there are good people in China and Korea that are also fighting for the benefit of dogs and cats. The world is watching, and this evil must, and will stop one day. Thank you for your comment………………………….it is time that this vile Barbaric Torturing ends. Mistreatment of dogs and cats and then torturing them and killing them to eat- you deserve a special place in hell and I will not buy Korean or Chinese goods until these barbaric acts stop! Never again Samsung and I’m relaying this message to everyone I know. For many years I have know about Dog Meat Trade. I fight it by signing petitions, donating funds, and sharing about this most savage flesh trade. What many don’t get, is the sadistic torture of companion pets. I make as many friends on Facebook to get me as close to the problem & solution. May God have mercy on those poor souls. Das ist unvorstellbar was da geschieht und die Menschheit verschliesst die Augen vor allem die Politiker.Sie verdienen ja noch an diesen barbarischen Geschäften vor allem wenn es sich um Pelz handelt.Wir müssen dieses Asiaten pack boykottieren und nichts mehr von dort konsumieren. What kind of nation is eating dogs?